As my cab pulled up to the Wilshire Ebell theater again, I saw a long line wrapped around the building, and the sidewalk was actually covered in red carpet. I went to where Thursday night’s media check in was, and there was nothing, so I ventured around the massive line, walking on the street rather than the carpet (still felt weird). On the far side of the building was the media and VIP check in, with another smaller, more ‘special’ red carpet. I checked in and got yet another laminate, and was told I could stand there with the rest of the press. Luckily, I found fellow GRAMMY community blogger MissMusicNerd there. We were both a little like, whoa…I was standing in front of CNN, and next to US Weekly, who’s representative was miffed at the VIPs coming through…’give me La Toya, Janet, Joe….just give me a Jackson and I can go!’. Ew. This afternoon’s ceremony was the Special Merit Awards, where the people receiving Lifetime Achievement awards get their proper ceremony rather than the quick 30 second mention that takes place during the telecast. Slowly but surely, each honoree, or the representatives accepting the posthumous award, arrived in their black sedans and wobbled out to check in at the very same desk I did. And these were no ordinary people. As official press, we waited for each one to come and stand for their photo opp, or for me to tweet about it. Across the street were the unofficial press with their cameras- and perhaps one crazed Cohen fan with an album in his hand. One of the challenges of doing this is being able to recognize people by sight. Luckily with this small of a group, a murmur just went down the line. 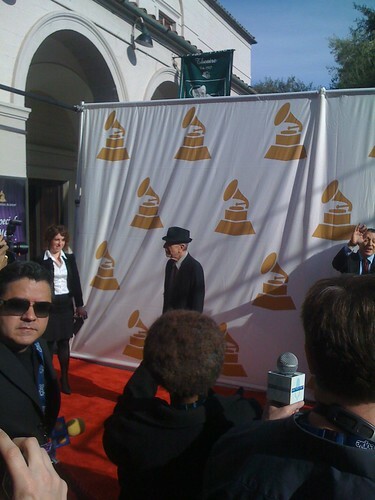 I knew Leonard Cohen, who wasn’t taking interviews but stopped for pictures and tipped his hat. They don’t make men like this anymore. David ‘Honeyboy’ Edwards came around and stopped and talked to MissMusicNerd. That man is magical. 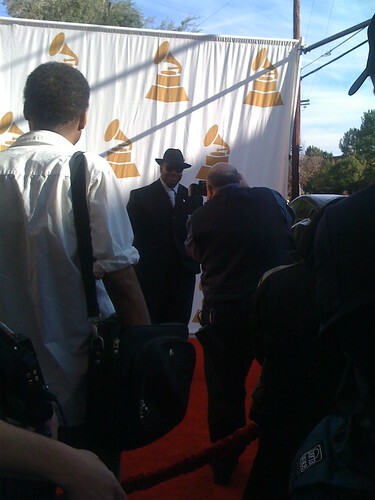 Jimmy Jam came and talked to the CNN cameras, and discussed the MJ tribute, and how he had just come from rehearsals. 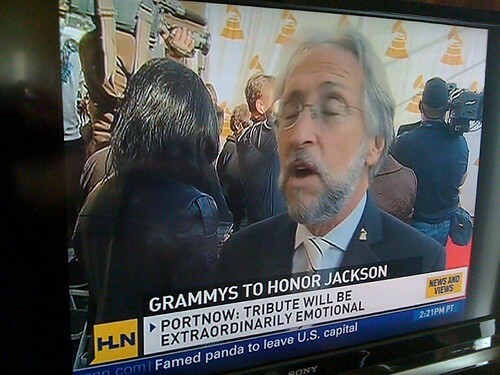 The CNN cameras also interviewed Neil Portnow behind me, and thanks to Umlaut, I have proof! 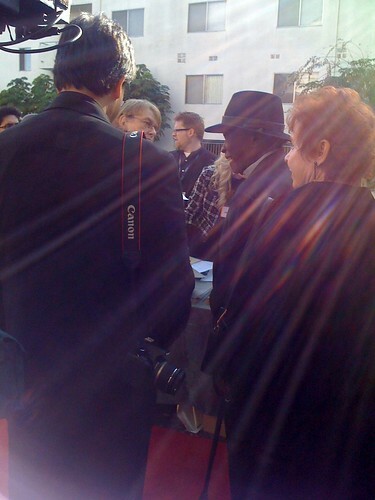 There were murmurs that The Jacksons would arrive any minute, but then we were shuttled into the theater, and up to the balcony (and then out to the hall, and then back to the balcony…the PR people didn’t know what to do with us). 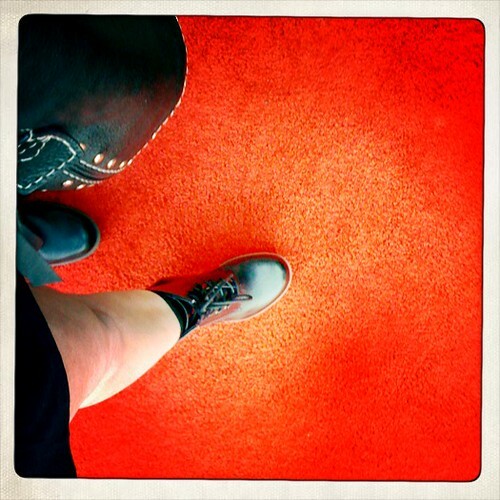 I stopped to take a quick pic on The Red Carpet, which I actually walked on this time! We took a front row seat and watched the GRAMMY high school ensemble jazz band play. It set the tone for the intimate, classy affair that was about to ensue. Each award was preceded by a nice video montage skimming the life of the recipient, often tear-jerking, always awe inspiring. Sometimes I feel like it’s impossible to live the kind of life that gets these awards anymore. The first awards to be handed out were technical ones: AKG mics and then one posthumous award to Thomas Alva Edison for inventing the phonograph. 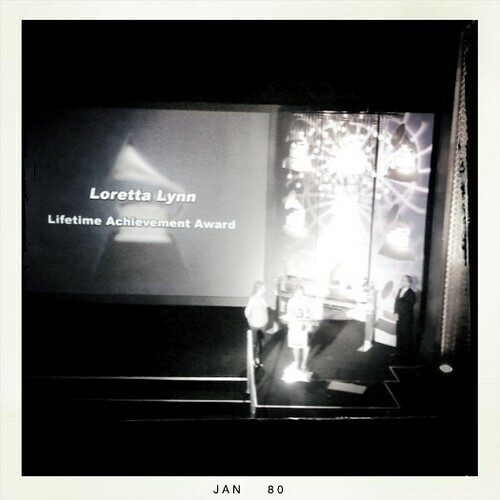 Let me tell you, it was weird to watch his great great granddaughters and son, and great x 3 nephew go accept his award. They made a comment about liking the lightbulbs in the room, too…GEEK JOKES! Love it. Seriously, 4 generations later and his ancestors are exactly as geeky as you would expect. Think about it. 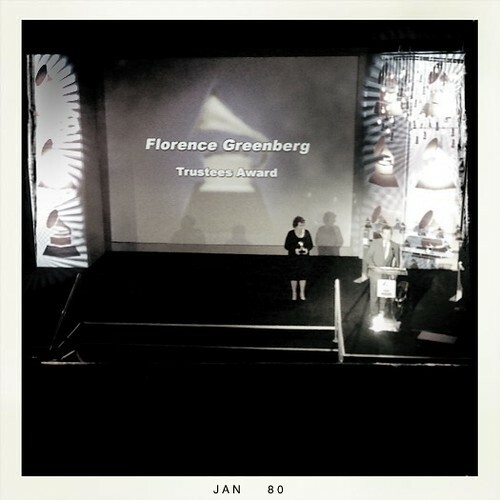 Next were the Trustees awards. One went posthumously to Florence Greenberg, who’s son and daughter accepted for her. Greenberg was sort of a revolutionary, being the first female to run a record label, founding Scepter Records. And then she turned The Shirelles into the first girl group to have a number one hit single. Girl Power! In the montage, I learned that she recorded the controversial ‘Louie Louie’ by The Kingsmen….it was their best selling record. Her son, who was led on stage by a seeing eye dog, had some cute things to say about her. “We couldn’t call her mother in the office”. Also, regarding mixing, “we would have to remix it again for her because she couldn’t understand the third word”. Harold Bradley, a Nashville session musician, also received a Trustees award. He is the most recorded guitar player in history! Now that is impressive. His acceptance speech was very spiritual, but also very humble. He said his grankids asked his wife “what does grandpa do?” and her response was “nothing, he just sits around, playing guitar”. He also said his first guitar was purchased at a drug store for $6, and he learned to play by ear. Also, he learned to read music but ‘not enough to mess up his playing’. The final Trustees Award went to Walter C. Miller, or Wally as he goes by. A self-proclaimed failed fiddle player, he has produced 30 years of awards shows- 29 years at the GRAMMYs, and also the Tonys and CMAs. His speech was hilarious if not a bit indecipherable. He thanked the GRAMMYs for putting up with him, stating that it’s ‘hard to take his humor sometimes’. He paused, and made it known he was going to take some time up there since ‘no one can play me off’. Then he started talking about how what he does has allowed him to get his teeth cleaned at home. “The first real show I directed was Lincoln’s Inauguration”. Onto the Lifetime Achievement Awards. Conductor, composer, and pianist Andre Previn was unable to attend, but sent in a video acceptance speech that was slightly arrogant but rightfully so. 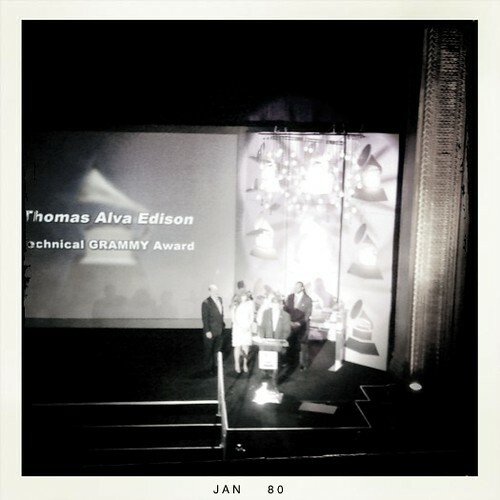 He explained that he won the very first year they gave GRAMMYs. He has so many that he ‘gave some to his kids’. But he’ll hold on to the Lifetime Achievement Award for a while. David ‘Honeyboy’ Edwards is the last of the original Delta blues guitarists. I am just in awe. 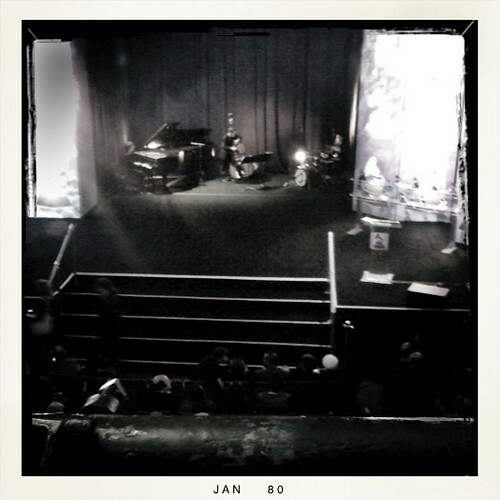 His montage was great, showing his recent sold out European tour. It talked about how he recorded with Sam Phillips and Chess in Chicago…crazy! He’s a living artifact. He kept his acceptance speech short and sweet, saying that he’s ‘still knockin’ ’em dead’ and let everyone know that the award wasn’t going to be a sign of retirement for him. ‘I’m still gonna play the blues’. Bobby Darin, who penned such songs as ‘Mack the Knife’, ‘Splish Splash’, and ‘Beyond the Sea’, also is credited with discovering Wayne Newton. 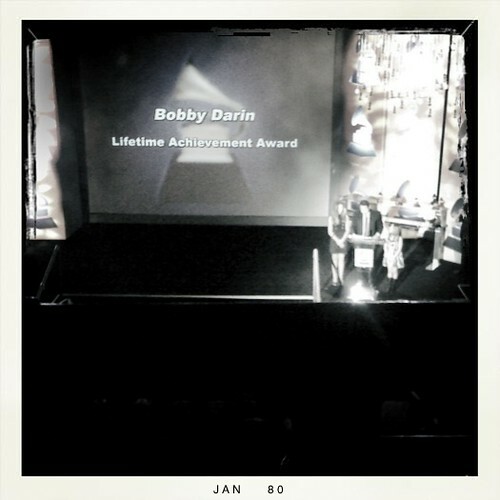 His son, Dodd and his two daughters, or back up singers as he called them, accepted the award. He was very choked up. He remembered being 6 years old in Vegas with his dad. His mom, Sandra Dee, had to raise him on his own from 12 years on. He described his father as part Elvis, part Sinatra, part Sammy Davis. He talked about how even though the press always portrayed his father as arrogant, he wasn’t. He told a story of how he stuck to his guns about having an African American comedian open for him back when they weren’t allowed to. It was sad to hear him talk about how his dad ‘knew he wouldn’t live long’, and left us with ‘it’s not the duration of the life, it’s what you leave behind to be remembered by’. Clark Terry is a trumpeter, who was part of the Tonight Show orchestra for many years. He slowly made his way to the stage with the help of his wife, son, and student. ‘Thanks the beautiful people who voted for me’. Quincy Jones was one of his students (he was there, but had to leave). When he had difficulty speaking, his wife jumped in: ‘you’ve made an old man very happy’. Loretta Lynn, the coal miner’s daughter who saw much success in the early 2000’s with her album with Jack White, Van Lear Rose, was unable to make it at the last minute because the family had been called in since her brother wasn’t doing well. Her granddaughters- Patsy and Peggy Lynn- accepted for her. They basically reiterated a phone conversation from earlier about how she was excited about the award. 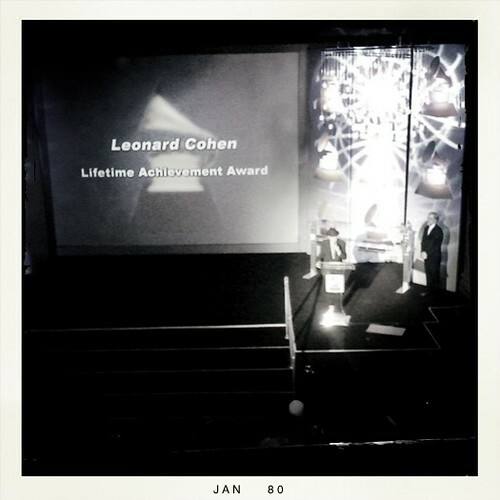 And the highlight of the night, really the whole weekend, for me was Leonard Cohen. I was unable to see him on his last tour- crazy expensive sold out shows, so this meant a lot to me. When he got up on stage, he took off his hat and did a little bow. They don’t make men like this anymore. 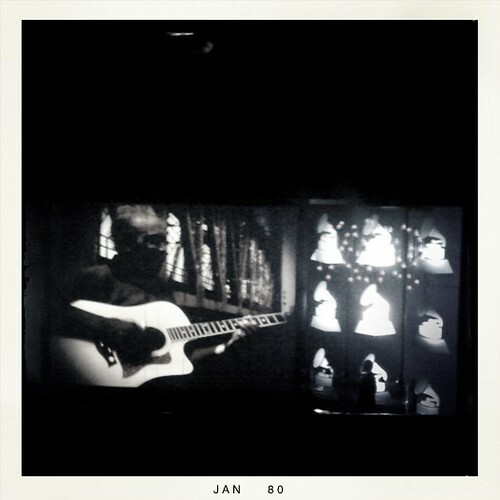 I sat there, wishing he would do one of his songs since I’d never seen him before, and just like that, wish granted. ‘Tower of Song’ stripped down at a podium on that particular night trumps just about anything you’ve ever heard anywhere. It’s like he wrote that with this moment in mind….in fact, at one point I thought maybe he had changed something, but no. I almost broke down right there, shaking, eyes glistening. It was a magical moment. And they saved the biggest one for last, Michael Jackson’s posthumous Lifetime Achievement award. To think that I would be here, watching this award happen, after having MJ pretty much be the soundtrack to my early childhood, is a total headtrip. As a dancer, his songs infiltrated every performance and recital I ever did in the ’80s. His manager, Frank DeLeo accepted for him. He told everyone that this award was for his children, calling Michael a good friend and a funny guy. He gave an example of how he would do things like randomly call him and ask ‘Are you watching the GRAMMYs? Do you believe what ____ just said? ?’, and then he’d laugh and hang up. 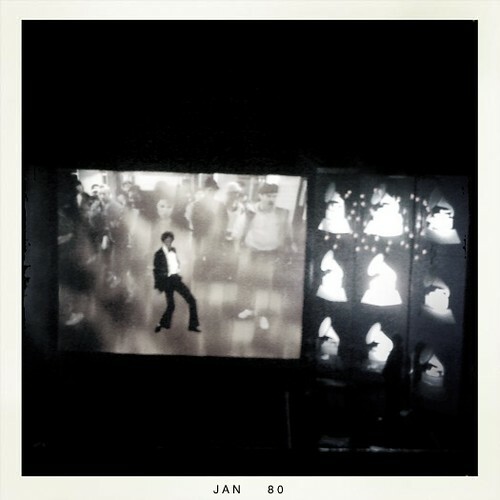 It was obvious that much of the MJ love was being reserved for the tribute on the actual telecast. 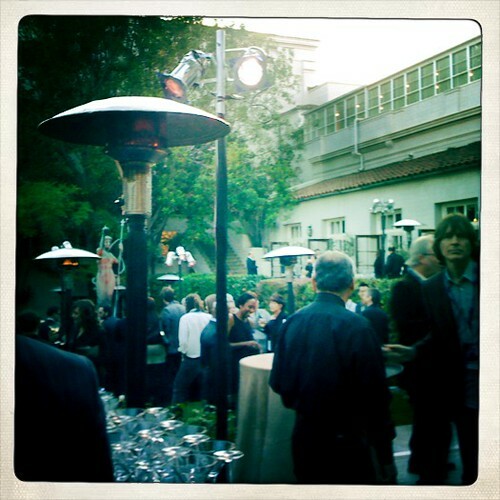 Afterward, we went to the Nominees Reception next door, where I drank cranberry juice out of a martini glass (no regular glasses allowed! ), was told to cut to the front of a line by some old school comedian looking fella (she’s about to give birth, for christ-sakes, let her in front! ), passed by Weird Al in the hall, and learned that they hide the best food at the party way in the back. Thank you for the fabulous commentary … I felt as if I was sitting right there with you! I am sure the memories will stay in your mind and heart forever. I am so happy you were able to be there, you deserve it more than anyone I know! thank you so much! very cool!